Prepare your hearts folks, you might need a moment. Hard boiled eggs can be made in the oven. Like, flawless, smooth, easy-to-peel hard boiled eggs. This is a game changer. Have you ever panicked when someone asked you to bring deviled eggs to a family get together? I have. It’s just that, I’m…well…what some people might call a “perfectionist”. And to be frank, I think the traditional process of hard boiling eggs is a perfectionist’s worst nightmare! I like my food to look presentable. If my food is not presentable, I will start the entire process over and fix it. So yeah–good idea–ask the perfectionist to bring the eggs because you can bet your bottom dollar that those eggs are not going to show up looking like they’ve all been chewed on and then cut up and made into an appetizer. I thrive on easy recipes. I take pride in working smarter, not harder. I like to save myself time and energy when I can! Traditional methods for hard boiling eggs call for old eggs, or room temperature eggs, or baking soda in your water, or some other wives’ tale. They want you to drop each egg into boiling water individually, count to fifty, remember which egg it was that you just dropped into the water, and then fish it out while you hope and pray that the yolk inside is cooked enough, but not too much. No way jose. Let me tell you what you need to do to make beautiful, smooth, hard boiled eggs that peel nice and easy. You preheat your oven to 330 degrees (F). You put one egg into each muffin pan opening. You bake them in the oven for 30 minutes. You take them out and plop them into a big bowl of ice water. You peel them. Preheat oven to 330 degrees (F). Arrange muffin tin by placing one egg in each muffin opening. Place egg-filled muffin tin into oven and bake for 30 minutes. When eggs are almost finished, fill a large bowl with ice and water. Set aside. Carefully drop eggs into bowl of ice water. Let rest until they are cool. The recipe for these Cheesy Ranch Cauliflower Breadsticks contains ZERO flour. They are totally gluten-free and extremely low in carbs! You will want to keep this recipe close! Holy smokes! Is it really February already?! Where does the time go? In case you didn’t know, today is Groundhog Day. Good old Punxsutawney Phil saw his shadow once again. So, yes. It really is February already! One month has really passed since New Years and I really need to start getting back on track with my low-carb eating habits. 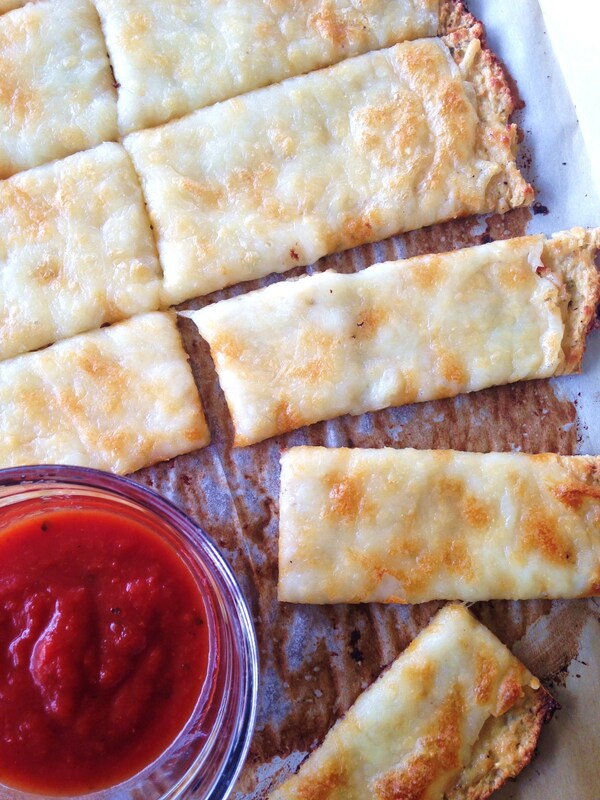 This recipe for Cheesy Ranch Cauliflower Breadsticks is a winner, winner, chicken dinner! The cauliflower binds with an egg and some parmesan cheese to make a hearty, flavorful crust. Gluten free friends– this concoction is a terrific alternative to buying a prepackaged GF mix because the main ingredient is a vegetable, hello!? Even if you are not avoiding gluten, it is pretty darn easy to eat vegetables when they don’t taste like vegetables! Now you can be sneaky with those picky eaters in your life! I used to hate cauliflower as a kid. It was always cut up raw and served cold next to broccoli on veggie trays…and it was disgusting. Bleh. It was powdery, chunky, gritty, and tasteless. I guess I probably still feel that way. I can’t eat it raw. I just can’t. It’s just not good. But…if I grind it up, mix it with some cheese, add a little ranch flavor, and top all that with even more cheese, I could eat cauliflower for days. Difficulty: A little advanced, but YOU CAN DO IT! Preheat oven to 450 degrees (F). Line a baking sheet with parchment paper and set aside. 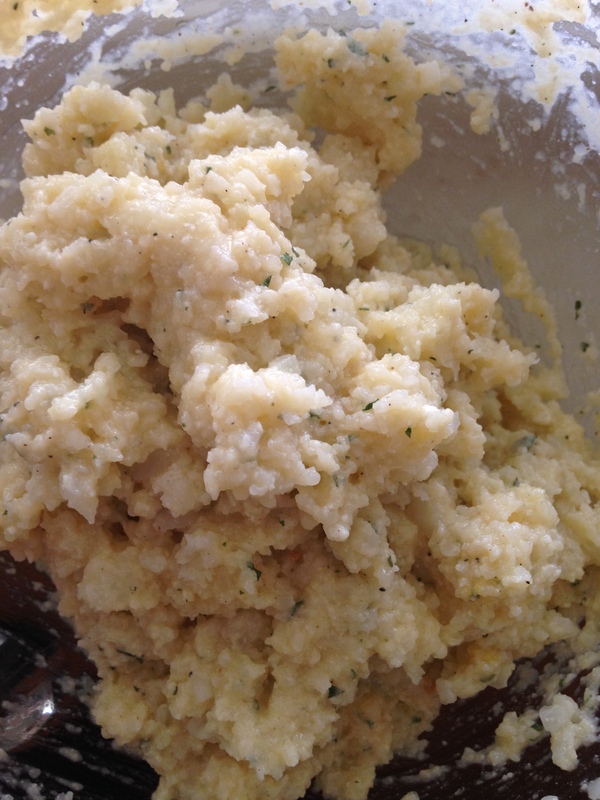 Empty bag of frozen cauliflower into food processor. Pulse until finely ground. Cauliflower should resemble a powdery, rice substance. Transfer ground cauliflower to microwave-safe bowl and cook in microwave for two minutes; stirring after each minute. This helps to fluff/steam cauliflower–you want the moisture to be pulled out of it. If steamed cauliflower is warm, refrigerate until cool. Pour mixture onto parchment paper-lined baking sheet and spread/shape into a pizza crust or breadstick shape. Do not spread too thin; should be about 1/4 inch thick. Bake crust in oven for 15 minutes or until lightly golden brown. 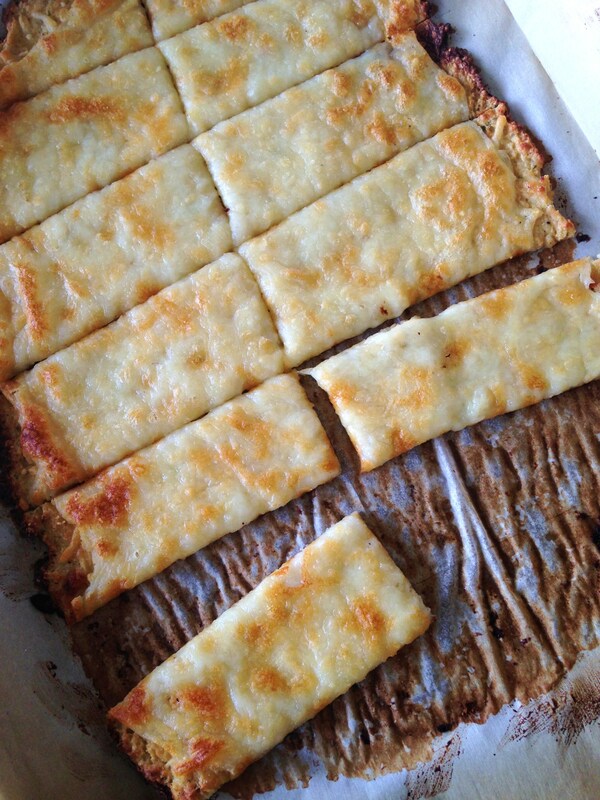 Remove crust from oven and layer with ranch dressing (like pizza sauce) and top generously with shredded mozzarella. Place pan back into oven for another 10-15 minutes until cheese is melted, bubbly, and golden. Slice and serve with marinara sauce or a sauce of your choice! ***Notes: If you do not have a food processor, I would suggest grating the cauliflower with a cheese grater and chopping it as finely as possible. If you do not have parchment paper, you can still make this! Just grease the pan extra, extra well. You can also use raw cauliflower, of course. You’ll just have to prepare it and steam it and start at step 4. 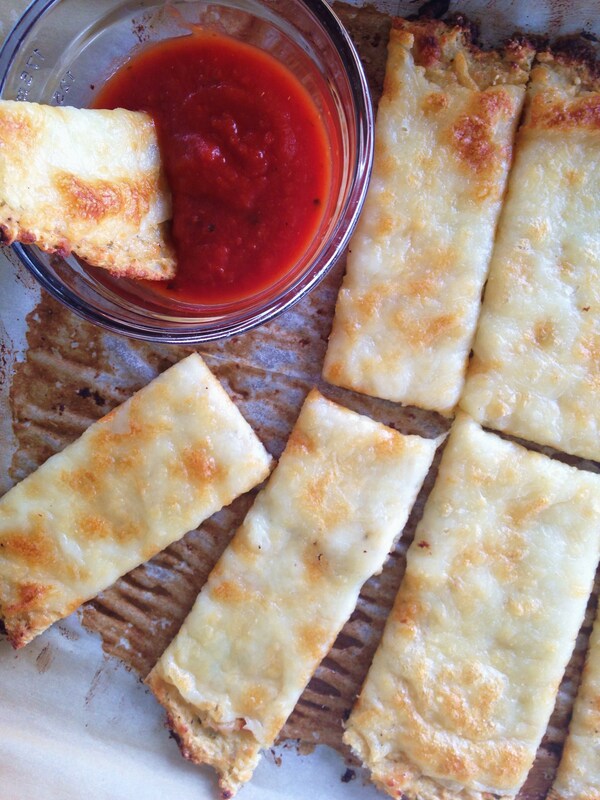 This recipe is also perfect for pizza crust! The base is the same. You can change the seasonings and substitute Italian seasoning or oregano. My golly, 2014 was the fastest year yet. I cannot believe it is 2-0-1-5 already. I feel like I was just getting used to writing 2014 on paper, and now I’m having to figure out how to change a 14 into a 15 without looking like a fool. So…yes…it is officially January. Sigh…January. The month of resolution writing and weight-loss goal making and redos and start overs and all those good intentions. Like everyone else, when January comes around in my world, my body reminds me that I’ve been overindulging for a little too long. January is when I start to switch back to a low(er)-carb lifestyle to wean myself off the crazy sugar-filled feeding frenzies I’ve become comfortable with. January brings a fridge full of hot dogs, lunchmeat, vegetables, eggs, and cream cheese. With that, I’ve gotta come up with meals that are satisfying, yet still low in carbs. 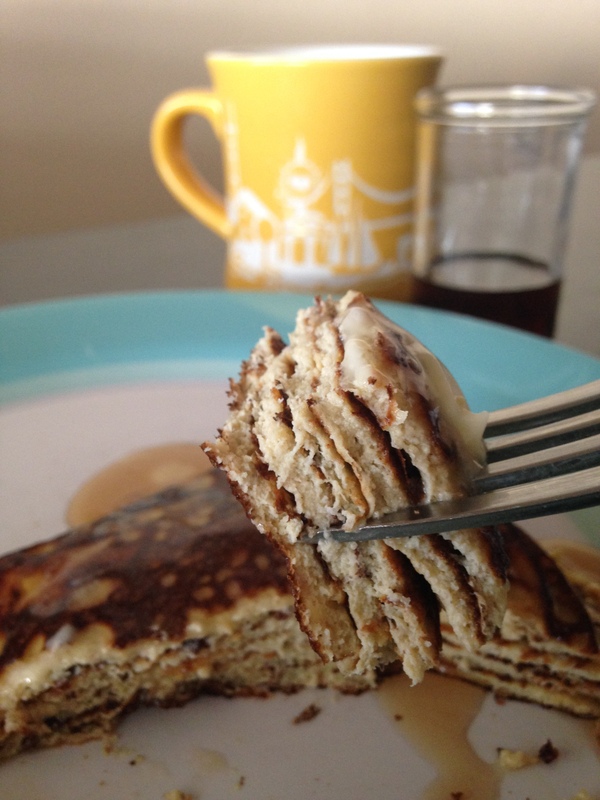 I recently discovered that you can make pancakes without any sort of flour! 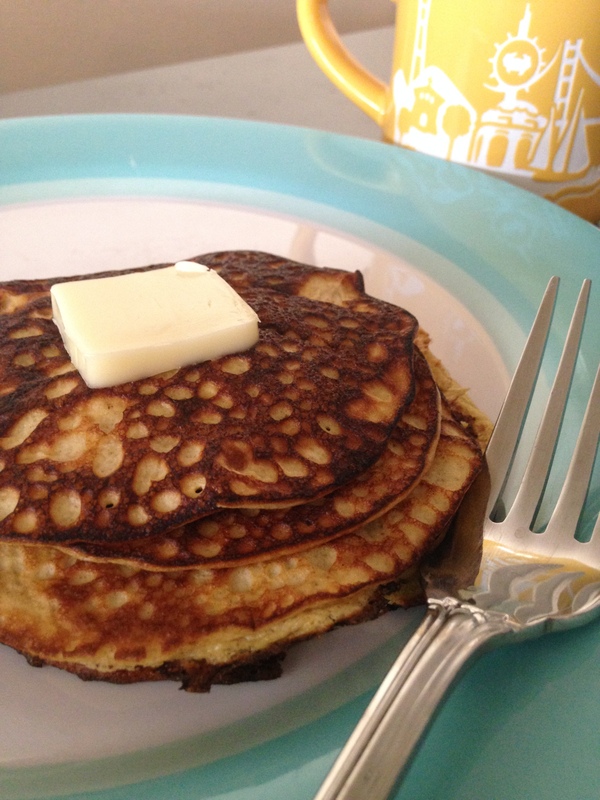 These Low Carb Pancakes are a great way to tame your sweet tooth and bring variety to a low carb diet. 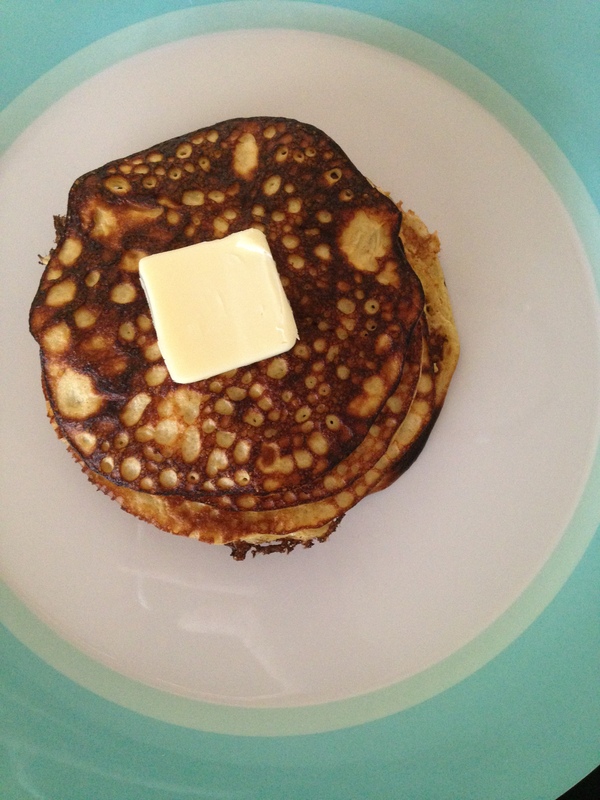 Even if you are not trying to eat fewer carbs, this pancake recipe is absolutely gluten-free and easy! Hope you love it! 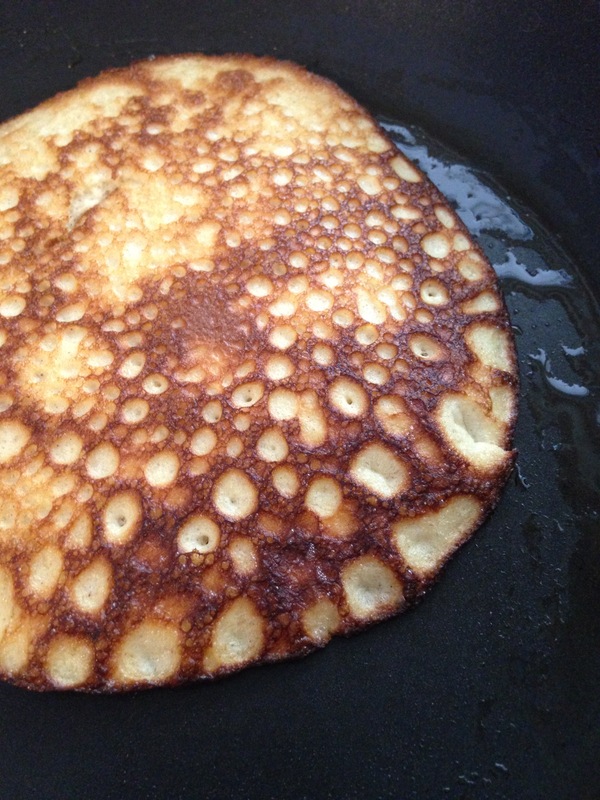 This is the texture/color you are shooting for after the pancake is flipped. You should let it cook long enough that there isn’t any wet liquid on top when you go to flip it. After flipping, cook for another minute just to heat it through. Don’t cook it too long, though. They burn pretty quick and taste like burnt eggs. I don’t know if you’ve ever burnt your eggs, but it is disgusting. Don’t do it. Little stack of yum! I got back from a quick trip to San Francisco this week and if you have ever been to San Francisco, you might recognize some of the things on my yellow coffee cup 🙂 It’s my new favorite! I crushed that entire stack with ZERO shame my friends. 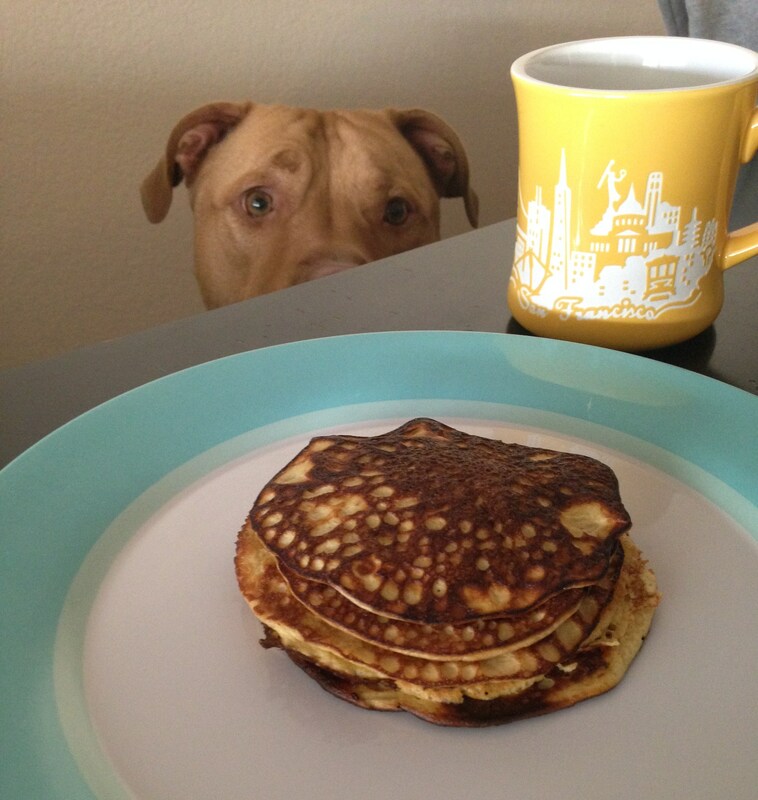 Pancakes with coffee is one of my favorite meals. SO good. So, so, very delectably darn good. Someone else wanted to try them too! 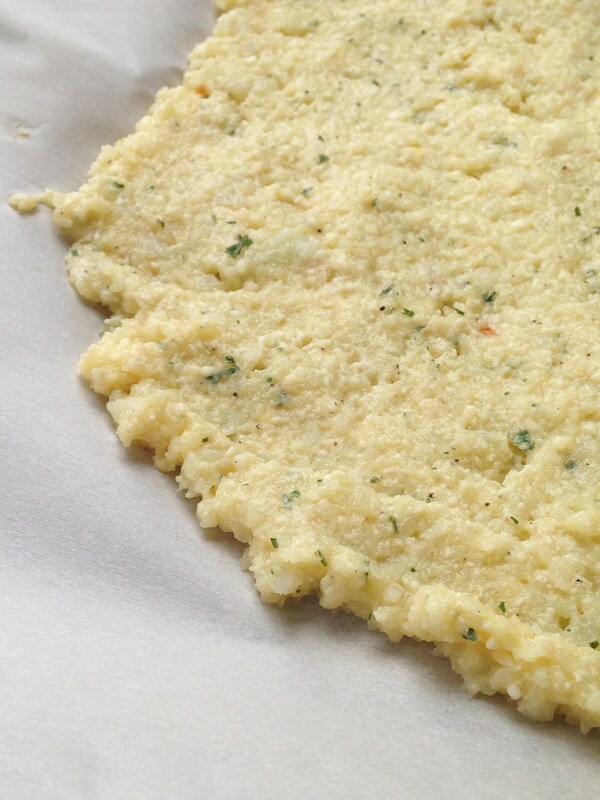 In a food processor or blender, blend all 4 ingredients together to create a thin batter mixture . While waiting on bubbles, turn stove to low-medium heat and preheat pan. 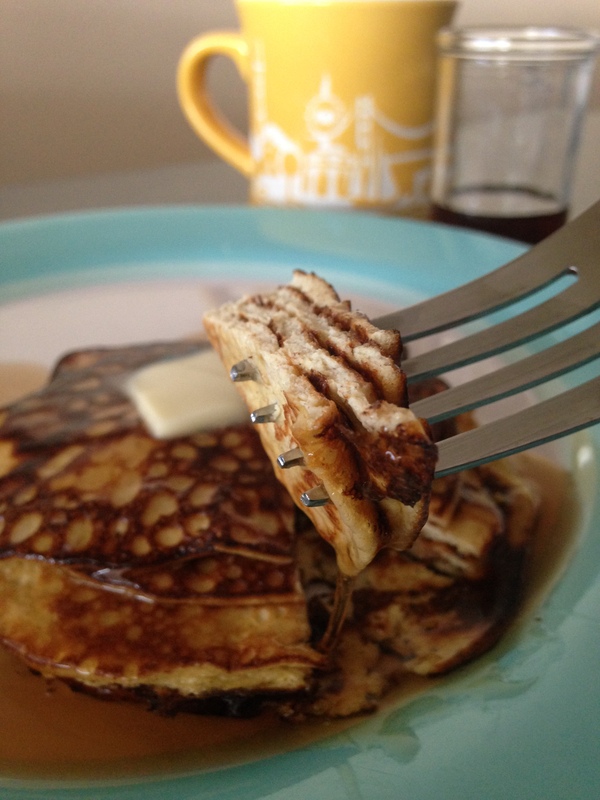 Top pancake stack with butter and sugar-free syrup or add your own fruit! Notes: The good thing about eating low carb is that you don’t have to count calories! The entire stack of pancakes has about 3 carbs total!